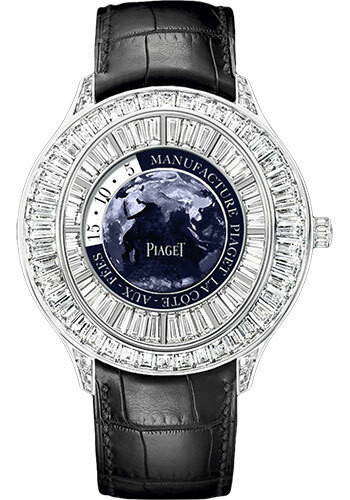 46.5 mm platinum case set with 565 brilliant-cut diamonds (approx. 3.65 ct) and 56 brilliant-cut diamonds (approx. 10.77 ct), 12.5 mm thick, sapphire back, blue dial, 836P hand-wound mechanical movement with jumping hours, dragging minutes, approximately 50 hours of power reserve, black alligator strap, folding buckle. Water resistant to 3 atm.